Way back in 2003, the original “Super Queen” track was a quality circuit house-inspired workout fit for some of the world’s darker nightclubs. Label boss and all-around house don DJ 19, found he was inspired by the comic of same name. Sadly, the tiny European banking country of Luxembourg’s recording economy seemingly collapsed, and took along possibly it’s only house label with it – leaving the original unreleased and MARINO BERARDI’s MB Recordings out of business. Seeing as the original “Super Queen” suffers from sounding somewhat dated and the original source files lost, DJ 19 came up with the brilliant idea of releasing it without the original version! New remixes were done by upcoming Canadian DJ/producer, JAY KAUFMAN and Luxembourgish(Now living in Hamburg, Germany) DJ/producer MARINO BERADI. Out on February 23rd exclusively on beatport. 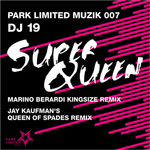 PARK LIMITED MUZIK starts out the New Year with a storming tech house and electro package. Way back in 2003, the original “Super Queen” track was a quality circuit house-inspired workout fit for some of the world’s darker nightclubs. Label boss and all-around house don DJ 19, found he was inspired by the comic of same name. For those who don’t know, it was the story of a woman who built her power gradually and finally she won fame as a fixer. Sadly, the tiny European banking country of Luxembourg’s recording economy seemingly collapsed, and took along possibly it’s only house label with it – leaving the original unreleased and MARINO BERARDI’s MB Recordings out of business. Seeing as the original “Super Queen” suffers from sounding somewhat dated and the original source files lost, DJ 19 came up with the brilliant idea of releasing it without the original version! Fast forward to 2009… Upcoming Canadian DJ/producer, JAY KAUFMAN steps up to remix duties that push the track into a futuristic mould. Jay’s managed to stay under the radar over the years with his music – shying away from the spotlight. 2009 will see him return, with releases on several labels and his long overdue album. Revealing his 1980s influences, Jay’s remix strikes of Japanese electronic music gods YELLOW MAGIC ORCHESTRA (YMO) and DEPECHE MODE during their Some Great Reward phase. Pumping house rhythms, a 303-laden groove and lead riff that will stick in your head like glue, all come together to create a remix with raw tension and refined melodies. The breakdown has its obligatory ‘Woo’ moment that should have your dancefloors reacting accordingly. The flip side sees Luxembourgish DJ/producer MARINO BERADI step up to the plate. Mario was the original A&R man behind “Super Queen” with his now defunct label MB Recordings. Now living in Hamburg, Germany, Marino has caught everyone's attention with several of his tracks and remixes being championed by the who’s who of the worldwide DJ glitterati. Being the first Benelux producer to be released and licensed on prestigious American labels like SUBLIMINAL and WAVE MUSIC, Marino is also making waves with his unique progressive production style that has seen him release principally on Belgian imprint, WALLY'S GROOVE WORLD. Other material has been released on FRESHFRUIT, RIVIERA and 19BOX RECORDINGS. His two most acclaimed tracks, “Expression in E Dub” (licensed by FRANÇOIS K for WAVE) and “Plan B” are reminiscent of the golden age of house music in the early 1990s. This sound has seen him get the appropriate accolades from the likes of DARREN EMERSON, Mr. C, COLIN McBEAN and many more.